SiO2 is the main component of silicate melts and thus controls their network structure and physical properties. The compressibility and viscosities of melts at depth are governed by their short range atomic and electronic structure. 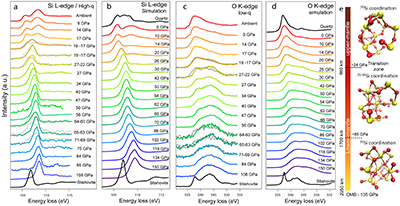 We measured the O K-edge and the Si L2,3-edge in silica up to 110 GPa using X-ray Raman scattering spectroscopy, and found a striking match to calculated spectra based on structures from molecular dynamic simulations. 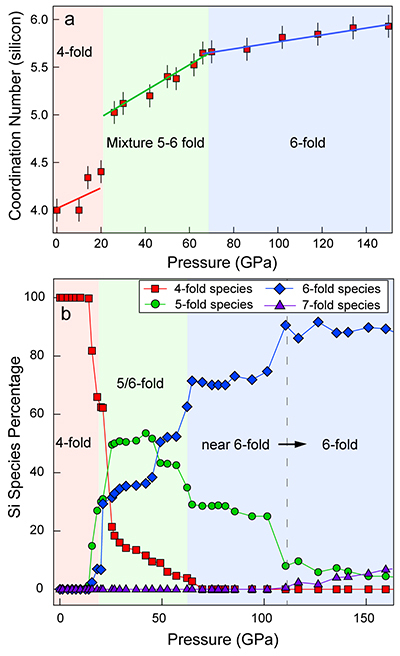 Between 20 and 27 GPa, Si species are converted into a mixture of Si and Si species and between 60 and 70 GPa, Si becomes dominant at the expense of Si with no further increase up to at least 110 GPa. Coordination higher than 6 is only reached beyond 140 GPa, corroborating results from Brillouin scattering. Network modifying elements in silicate melts may shift this change in coordination to lower pressures and thus magmas could be denser than residual solids at the depth of the core-mantle boundary. Murakami, M., Bass, J.D. (2010) Spectroscopic Evidence for Ultrahigh-Pressure Polymorphism in SiO2 Glass. Physical Review Letters 104, 025504. Sanloup, C., Drewitt, J.W.E., Konopkova, Z., Dalladay-Simpson, P., Morton, D.M., Rai, N., van Westrenen, W., Morgenroth, W. (2013) Structural Change in Molten Basalt at Deep Mantle Conditions. Nature 503, 104–107. Benmore, C.J., Soignard, E., Amin, S.A., Guthrie, M., Shastri, S.D., Lee, P.L., Jarger, J.L. (2010) Structural and Topological Changes in Silica Glass at Pressure. Physical Review B 81, 054105. Sato, T., Funamori, N. (2010) High-Pressure Structural Transformation of SiO2 Glass up to 100 GPa. Physical Review B 82, 209604. Prescher, C., Prakapenka, V.B., Stefanski, J., Jahn, S., Skinner, L.B., Wang, Y. (2017) Beyond Sixfold Coordinated Si in SiO2 Glass at Ultrahigh Pressures. Proceedings of the National Academy of Sciences 114, 10041–10046. Wu, M., Liang, Y., Jiang, J.-Z., Tse, J.S. (2012) Structure and Properties of Dense Silica Glass. Scientific Reports 2, 398. Ohira, I., Murakami, M., Kohara, S., Ohara, K., Ohtani, E. (2016) Ultrahigh-Pressure Acoustic Wave Velocities of SiO2-Al2O3 Glasses up to 200 GPa. 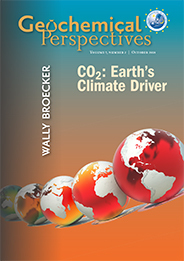 Progress in Earth and Planetary Science 3, 18. Karki, B.B., Bhattarai, D., Stixrude, L. (2007) First-Principles Simulations of Liquid Silica: Structural and Dynamical Behavior at High Pressure. Physical Review B 76, 104205. Meade, C., Jeanloz, R. (1987) Frequency-Dependent Equation of State of Fused Silica to 10 GPa. Physical Review B 35, 236–244. Petitgirard, S., Malfait, W.J., Journaux, B., Collings, I.E., Jennings, E.S., Blanchard, I., Kantor, I., Kurnusov, A., Cotte, M., Dane, T., Burghammer, M., Rubie, D.C. (2017) SiO2 Glass Density to Lower-Mantle Pressures. Physical Review Letters 119, 215701.
) and requires more precise investigations on the changes in local structure with pressure. 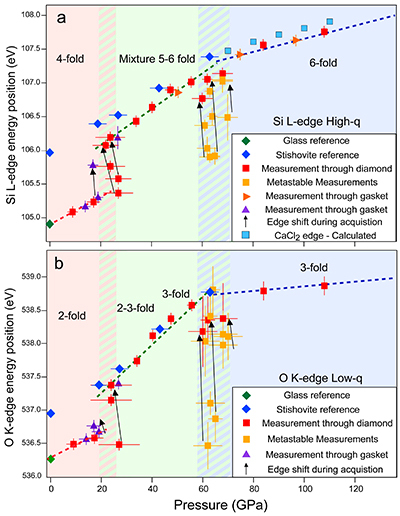 Kono, Y., Shibazaki, Y., Kenney-Benson, C., Wang, Y., Shen, G. (2018) Pressure-Induced Structural Change in MgSiO3 Glass at Pressures near the Earth’s Core–mantle Boundary. Proceedings of the National Academy of Sciences of the United States of America 115, 1742–1747. ), and requires complementary analyses as well as further improvement in high pressure PDF studies. Sternemann, C., Wilke, M. (2016) Spectroscopy of Low and Intermediate Z Elements at Extreme Conditions: In Situ Studies of Earth Materials at Pressure and Temperature via x-Ray Raman Scattering. High Pressure Research 36, 275–292. Lin, J.-F., Fukui, H., Prendergast, D., Okuchi, T., Cai, Y.Q., Hiraoka, N., Yoo, C.-S., Trave, A., Eng, P., Hu, M.Y., Chow, P. (2007) Electronic Bonding Transition in Compressed SiO2 Glass. Physical Review B 75, 012201. Fukui, H., Kanzaki, M., Hiraoka, N., Qai, Y.C. (2008) Coordination Environment of Silicon in Silica Glass up to 74 GPa: An X-Ray Raman Scattering Study at the Silicon L Edge. Physical Review B 78, 012203. ). However, the last report does not show any evidence for changes in Si CN, because of low signal and energy resolution, and concluded that Si remains predominantly 4-fold coordinated up to 74 GPa. Gilmore, K., Vinson, J., Shirley, E.L., Prendergast, D., Pemmaraju, C.D., Kas, J.J., Vila, F.D., Rehr, J.J. (2015) Efficient Implementation of Core-Excitation Bethe-Salpeter Equation Calculations. Computer Physics Communications 197, 109.
. (See Supplementary Information for experimental and calculation details). We found a striking match between our experimental spectra of cold compressed glass and the calculated spectra of the quenched high pressure melt with: (i) two major discontinuities at ~20 GPa and ~60 GPa, and (ii) similar structures for the glass and the quenched melt from MD simulation. In addition, we measured the six-fold coordinated reference stishovite up to 60 GPa. It shows that Si in the glass does not reach complete 6-fold coordination at high pressure, but rather only approaches a CN of 6 at 110 GPa as corroborated by the MD simulations. At the same time, O fulfills 3-fold coordination at 40 GPa. With this unique data set we can establish the electronic and coordination changes in SiO2 to core-mantle boundary (CMB) pressures, influencing the macroscopic properties of SiO2. Our experimental data show significant changes in shape for both the Si L2,3-edge (Fig. 1a) and O K-edge (Fig. 1c) at high momentum transfer (|q|). These changes are observed for both edges at similar pressures and are well reproduced by our calculated spectra (Fig. 1b-d; spectra were shifted in energy loss to the experimental edge onsets). We report precise edge onsets as a function of pressure for both elements from our experimental data for the glass up to 110 GPa and the reference stishovite up to 60 GPa. All the data for Si low |q|, stishovite spectra and edge onset values can be found in the Supplementary Information (Figs. S-2, S-3, S-6 and Table S-1). We did not observe changes in the spectra in the first 14-17 GPa and confirm that four-fold coordinated Si (Figs. 2, 3) remains predominant. At 17 GPa, the peak ratio of the Si L2,3-edge spectra changes with a reduction of the second peak at 108.5 eV and a shift of the edge onset from 104.9 eV (at ambient) to 105.3 eV (at 17 GPa). Between 19 and 27 GPa we observed that the two peaks merge into a broader single peak (Fig. 1a) with a clear edge onset shift to higher energy of 106.2 eV (Fig. 2a). For the O K-edge, rapid changes between 17 and 19 GPa were also observed, with a second peak appearing at ~544.7 eV (Fig. 1c) and the edge onset shifting from 536.3 eV (ambient) to 536.7 eV (at ~19 GPa) and up to 537.4 eV at ~27 GPa (Fig. 2b). The latter illustrates an evolution of coordination also for the oxygen atoms. These changes in spectral shapes are associated with a slight drop in pressure of 2 to 5 GPa during the measurements (Figs. 1, 2). Above 27 GPa, the edge onset of both edges increases linearly with pressure: the Si L-edge reaches 107.0 eV and the O K-edge 538.6 eV at 56 GPa. Our data on stishovite compressed to 63 GPa show a linear trend of the edge onset for this canonical 6-fold reference phase, for both edges. All the Si L-edge onset values for the glass fall below that of stishovite, but tend to approach similar values around 60 GPa (Fig. 2a). For oxygen, the edge onset of the glass becomes similar to that of stishovite at around 30 GPa. This indicates that the oxygen coordination (O-Si) in the glass approaches quite rapidly a CN of 3, like that in stishovite at such pressure (Fig. 2b). This observation is consistent with a mixture of 5- and 6-fold coordinated Si at these pressures and likely pinpoints the disappearance of Si. Further, it may even indicate that Si is arranged in a mixture of edge-sharing octahedra and trigonal bipyramids, as both polyhedra require O with CN of 3. Such fine features in the electronic topology of O and Si can only be addressed using XRS, which measures the electrons directly involved in the bonding. The calculated spectra of the quenched melt from MD show similar changes, although the peak ratio changes at lower pressure (14 GPa, Fig. 2b). These changes are completed for both edges at 26 GPa, similar to the experiment. Above this transition, at 27 GPa, spectra for both edges resemble the ambient stishovite reference with a single peak for the Si L2,3-edge and a doublet for the O K-edge (Fig. 1a-d). These spectral shapes could indicate that the 6-fold CN has been completed for a pressure as low as 30 GPa. However, our MD simulations indicate that between 20 to 27 GPa, a rapid decrease of Si occurs, which is replaced by a mixture of an intermediate five-fold coordinated Si species with Si up to 60 GPa (Fig. 3b). The calculated spectra for both Si and Si are nearly identical with only minor differences, which explains the aspect of the Si L-edge of glass being similar to the 6-fold spectra. The lack of a Si reference for SiO2 combined with the similarity of Si and Si spectra makes it difficult to observe a distinct signal of Si in experimental and calculated spectra (Fig. S-4). ). However, the signatures of the transition are consistent with the one at ~20 GPa which marked the disappearance of Si for a mixture of -Si. We can also observe that the shift of edge onset with pressure for both Si and O (Fig. 2a,b) follows exactly the trend given by the CN evolution as a function of pressure from MD simulations (Fig. 3a). The changes in slope for the different domains of Si species from MD (Fig. 3a,b) are in perfect agreement with our measured edge onset shift with pressure. Thus, we can interpret the breaks in the edge onset slopes as a function of pressure as a good marker for the Si coordination change. Kono, Y., Kenney-Benson, C., Ikuta, D., Shibazaki, Y., Wang, Y., Shen, G. (2016) Ultrahigh-Pressure Polyamorphism in GeO2 Glass with Coordination Number > 6. Proceedings of the National Academy of Sciences of the United States of America 113, 3436–3441. Hong, X., Shen, G., Prakapenka, V.B., Rivers, M.L., Sutton, S.R. (2007) Density Measurements of Noncrystalline Materials at High Pressure with Diamond Anvil Cell. Review of Scientific Instruments 78, 103905.
) with a saturation of the density increase for higher pressure. A density crossover with solids has not been reported for SiO2, precluding that the glass reaches a CN higher than the solid. Du, X.P., Tse, J.S. (2017) Oxygen Packing Fraction and the Structure of Silicon and Germanium Oxide Glasses. Journal of Physical Chemistry B 121, 10726–10732. Spiekermann, G., Harder, M., Gilmore, K., Zalden, P., Sahle, C.J., Petitgirard, S., Wilke, M., Biedermann, N., Weis, C., Morgenroth, W., Tse, J.S., Kulik, E., Nishiyama, N., Yavaş, H., Sternemann, C. (2019) Persistent Octahedral Coordination in Amorphous GeO2 Up to 100 GPa by Kβ'' X-Ray Emission Spectroscopy. Physical Review X 9, 011025. Meade, C., Jeanloz, R. (1988) Effect of Corrdination Change on the Strength of Amorphous SiO2. Science 241, 1072–1074.
) glasses. The depolymerised nature of such compositions would facilitate the increase of CN > 6 for Si at pressures of the lower mantle producing negatively buoyant silicate at the CMB during the early Earth’s formation or today in the modern mantle. We acknowledge the ESRF for provision of beamtime under the proposal ES-431. We acknowledge N. Dubrovinskaia for providing us the stishovite standard material. We wish to thank Dr. Yunfeng Liang for providing the ab initio MD trajectories used in this study. We acknowledge the support of ID20 beamline staff, M. Moretti Sala and C. Henriquet. SP is financed by a DFG grant (PE 2334/1-1). The Scios Focus Ion Beam at BGI was financed by a DFG grant No. INST 91/315-1 FUGG. CS and CW would like to thank M. Tolan for discussion and general support of these activities and acknowledge funding by the BMBF (05K13PE2 and 05K16PE1). Most of the data on SiO2 glass at high pressure have been obtained by X-ray diffraction (XRD) and show a change in the average coordination number (CN) from four- to six-fold starting at ~20 GPa and completing at pressures as low as 40 GPa (Benmore et al., 2010; Sato and Funamori, 2010). Many studies reported significant structural changes in silicate glasses at high pressure with potentially similar Si coordination changes in glasses and melts (Karki et al., 2007; Benmore et al., 2010; Sato and Funamori, 2010; Wu et al., 2012; Sanloup et al., 2013). Such changes seem also independent of the measurement time as illustrated by the first sharp diffraction peak position measured within hours (Sato and Funamori, 2010), minutes (Benmore et al., 2010; Prescher et al., 2017), or even a few seconds (Sanloup et al., 2013). Thus, XRS brings important evidence that the electronic shell around the two atoms can be compressed and re-arranged in a different way than the simple hard sphere model would explain (Du and Tse, 2017), which is often used to model the oxygen packing fraction. Only a few experiments have reported data using XRS on silica at high pressure on the O K-edge (Lin et al., 2007) and on the Si L-edge (Fukui et al., 2008). We complemented our measurements on the quenched SiO2 melt at high pressure with first principles spectral calculations by solving the Bethe-Salpeter Equation (BSE) using the OCEAN code (Gilmore et al., 2015) based on trajectories from ab initio molecular dynamic (AIMD) simulations by Wu et al. (2012). It seems unlikely that a CN > 6 is formed at pressures above 60 GPa, because there is no evidence of a further densification of SiO2 glass compared to crystalline phases (Petitgirard et al., 2017), unlike in GeO2 for which a CN > 6 has been recorded at 60 GPa (Kono et al., 2016) where the glass density may equal or even cross that of the crystal (Hong et al., 2007). For instance, the CN of Si and Mg as well as the individual Si-O and Mg-O bond distances could not be solved using PDF in a recent report on MgSiO3 glass (Kono et al., 2018), and requires complementary analyses as well as further improvement in high pressure PDF studies. 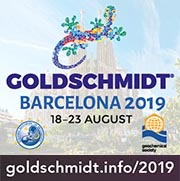 It is also possible that the structural re-arrangement at 60 GPa mimics the stishovite to CaCl2 transition in the solid as observed for the MgSiO3 system (Kono et al., 2018). Similarly, density measurements of SiO2 glasses are in very good agreement with each other, regardless of the starting glass material (Meade and Jeanloz, 1987; Petitgirard et al., 2017), and are also in agreement with the quenched liquid from molecular dynamic (MD) simulations (Wu et al., 2012). This may also occur in silicate melts (Sanloup et al., 2013), with large influences on the chemical and physical properties of melts at such pressures, such as change in melt viscosity (Meade and Jeanloz, 1988) or partitioning of elements (Sanloup et al., 2013). This provides a good explanation for the change of compressibility at such pressures in the density data (Petitgirard et al., 2017), but also for the variation of strength of the glass (Meade and Jeanloz, 1988). SiO2 is the main component of silicate melts and is often used as a reference model to compare with the behaviour of other amorphous silicate compounds (Murakami and Bass, 2010) and melts at high pressure (Sanloup et al., 2013) because of its network forming nature in silicate magmas. Brillouin spectroscopy measurements also suggest an increase in velocities, possibly related to a CN higher than six-fold, at pressures above ~140 GPa for SiO2, 130 GPa for MgSiO3, and 110 GPa for Al-rich silicates (Murakami and Bass, 2010, 2011; Ohira et al., 2016). The MD calculations show that Si-coordination only starts to appear at ~110 GPa and becomes significant at ~150 GPa (Fig. 3b), corroborating Brillouin spectroscopy measurements with an observed increase of sound velocities at such pressure in SiO2 (Murakami and Bass, 2010). The increase in sound velocity in SiO2 at 140 GPa measured by Brillouin spectroscopy (Murakami and Bass, 2010) could then be due to a densification of the glass linked to an evolution of the CN of Si above 6 (Wu et al., 2012). Depolymerised melt compositions, containing network modifying cations (e.g., Mg, Ca, Al) have shown stronger densification at lower pressures, closer to the CMB as illustrated by Brillouin measurements on MgSiO3 and Al-rich SiO2 (Ohira et al., 2016) glasses. Still, the mechanisms associated with such high densification and compressibility (Petitgirard et al., 2017) and their link to local structural changes, remains debated (Sato and Funamori, 2010; Prescher et al., 2017) and requires more precise investigations on the changes in local structure with pressure. At 60 GPa, a change in compressibility was measured for SiO2 (Petitgirard et al., 2017) with a saturation of the density increase for higher pressure. Between 40 and 130 GPa, it is unclear whether the CN increases above 6 (Prescher et al. 2017) or plateaus around 6 (Sato and Funamori, 2010) before increasing further above 140 GPa (Wu et al., 2012). These results are quite different from those obtained by a recent XRD analysis (Prescher et al., 2017), which suggests an average CN of 6 or higher for pressures of 40 GPa and above, but more consistent with a previous report that show a plateau of CN = 6 at around 40 GPa (Sato and Funamori, 2010). The same compression mechanism takes place in GeO2 glass as measured with X-ray emission spectroscopy (Spiekermann et al., 2019). X-ray Raman scattering (XRS) (Sternemann and Wilke, 2016 and reference therein) spectroscopy allows for measurements of X-ray absorption edges of light elements relevant for Earth compositions (Si, Mg, Al, Ca, S, O, Fe) using X-ray energies of 9.7 keV with a resolution of 0.7 eV.